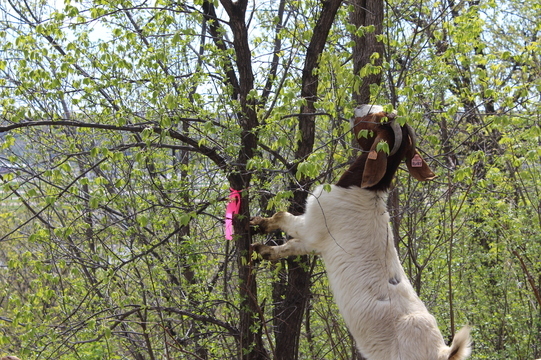 To control the spread of invasive species along the Mississippi river, the Great River Passage is teaming up with the City of Saint Paul’s Natural Resources team to introduce grazing goats to select Saint Paul parks. Now through fall 2017, these hungry goats will eat unwanted vegetation like buckthorn and garlic mustard inside fenced-in areas of Indian Mounds Regional Park, Crosby Farm Regional Park, and Hidden Falls Regional Park. Removing invasive plants is a part of the city’s routine park maintenance efforts, but using goats is a new, ecologically sensitive approach. Goats are ideal for this job because they are light on the land and can easily navigate steep bluff terrain. They can also eat plants that are hazardous to other animals. If you see the goats at work, you are welcome to watch but please do not interact with them. The goats will be enclosed in a fence to keep them safe and will be routinely monitored by caretakers. This effort is a part of an environmentally friendly, multi-year approach to ensure that natural plants are able to flourish along the Mississippi River. 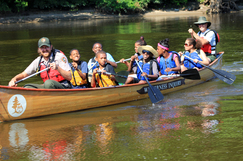 Learn more about this initiative by visiting us at https://greatriverpassage.org/projects/. The selected photographers in residence are Monica Bryand, Erin D. Carter, and Chris Juhn. All three have diverse perspectives, high-quality portfolios, and unique strengths and styles, from photojournalism to wildlife photography. The photographers’ growing image library will be featured in a digital gallery on our website and will culminate in a published project at the end of the residency. We look forward to seeing their work! Use the hashtag and win! The Great River Passage initiative is also launching a photo contest to gather photos of the Mississippi River. To participate in the photo contest, post pictures of the Mississippi River in Saint Paul to Facebook, Twitter or Instagram using the hashtag #STPriver. Winning photos that capture the river in one of the four categories will be chosen on a monthly basis. Winners must follow the Great River Passage on Facebook, Twitter or Instagram.